To help kids stay in school, Kaguri provides meals, filtered water, a nurse, and yes, snazzy uniforms. Twesigye Jackson Kaguri's American Dream was motoring along quite nicely until he was besieged by grandmothers. Born in a remote part of western Uganda, he'd studied hard enough to get to college in the capital, Kampala, and then to the U.S. He had an American job, an American wife and the beginnings of a down payment to buy a house. Then in April 2001, he took his wife to visit his home village, Nyakagyezi, and the grannies flooded in, seeking help raising their grandchildren left orphaned by AIDS. The Kaguris decided to divert their down payment, all $5,000 of it, to build a free school for the poorest orphans in the village. Kaguri knew he'd have to pay for everything  teachers, supplies, a nurse. But he also knew how to crowdsource. "Everyone in the community who lined up to ask me for help or money," he says, "we gave them a hoe or asked them to help." Back in Indiana, Kaguri went on a start-from-scratch fundraising campaign. He got donations from his soccer team, the janitor at his kid's school, local churches and the Rotary Club. In 2004 the Toronto-based Stephen Lewis Foundation gave him $25,000, his biggest grant to date. 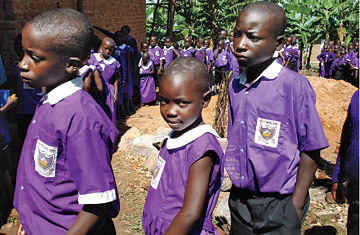 When the Nyaka AIDS Orphans School opened in 2003, the children arrived enthusiastically. But they fell asleep in class, and absenteeism grew. So the school started providing a meal and extended its filtered-water supply to the village. The students' grannies were given hygiene training and grants to build bathrooms and kitchens. Slowly, attendance improved. When Nyaka graduated its first class of sixth-graders in 2008, 21 of 22 students got a B+ or better on national tests. In 2009, all 26 did. Kaguri, 39, hasn't slowed down. He's started a second school, a farm and a library open to all local residents. He also has a book, The Price of Stones, coming out this month. "Many people look at the problem and how big the numbers are and are overwhelmed," he says. "But for me, I was born stubborn." In May, Kaguri finally gave up one thing  his day job  so he could focus on the schools full time.